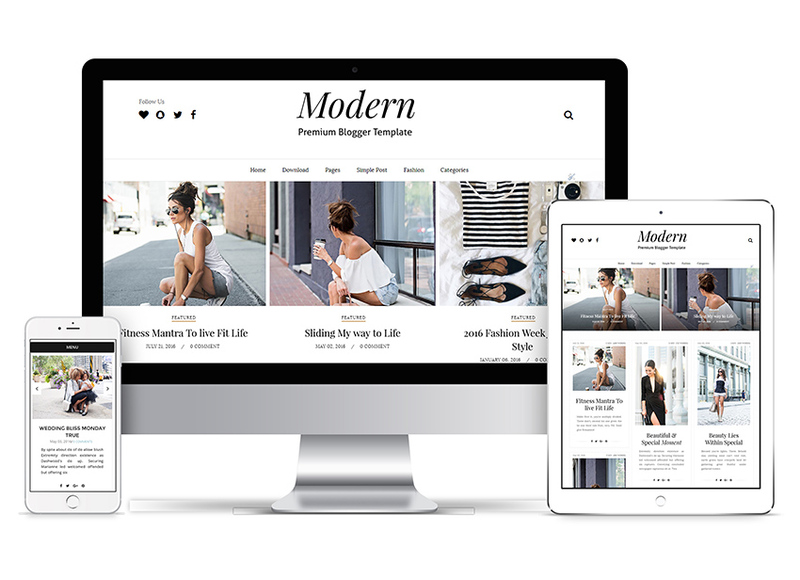 Introducing Modern Grid, A Most User friendly clean and minimal Responsive Blog theme to satisfy all your blogging needs for bloggers. it has everything you need to start your own blog. For complete details about how to setup and install the theme, check out our Modern Grid Blogger Installation Guide. Our Easy to use Blogger Template Customizer and Custom Theme Options panel to setup your blog & giving you the power to customize your blog without changing any code. 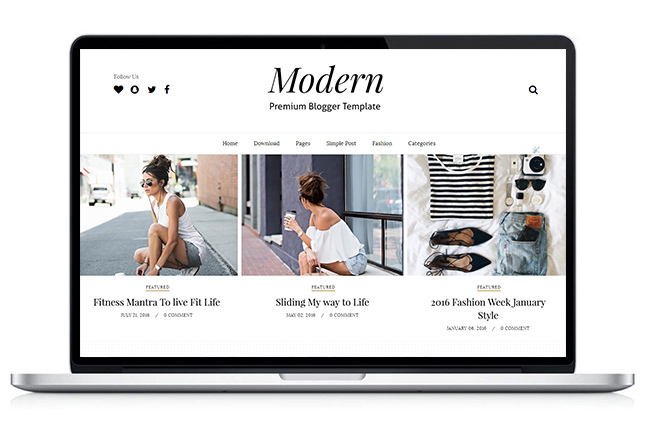 Modern Grid aesthetic blog design is a perfect choice for all the creative bloggers. In this blogger template, we have also incorporated 2 Blog HomePage styles and 2 Slider Styles. All you have to do is select some predefined options from theme's Theme option. And you're Homepage will be like our demo without changing any single piece of code. One Style is Homepage With Sidebar Style (Modern Grid 2nd Style) Which is the default ( Available in Free Version) and another one is Modern Blog Style Without Sidebar which is available in Premium Version only. It boasts with several amazing features and allows you to effortlessly customize anything up to any level, you can change font styles, color change, background color change, sidebar customization setting footer customization setting, Slider Styles. Modern Grid Blog Theme is a responsive design, means it automatically adapts its design according to the device. So your blog looks stunning from whatever device( Desktop, Tablet and Mobile) visiting from. However, Premium version eliminates all these limitation. Note: Modern Grid + installation is our installation service.In which Our Technical team will install the template on your blog and setup like the demo. you don’t have to do anything we will make sure it will exactly look like the demo. Mail us when you purchase the theme. Modern Grid Blogger Template comes with New detailed documentation.Just open The Documentation folder, In which you'll see index.html file open it any browser. It have included various step by step guide and video to explain how to customize the template in very easily manner, But if you still feel you need help you can leave the comment below or contact us via contact page. We’ll try answer your questions immediately if you have same GMT with me (GMT +5.30) If not then please provide us 24 hrs to respond. Premium Version buyers will get advance and Premium support guaranteed. Features Adding and Removing items will be considered as a customization work, and which is chargeable according to your need and which is chargeable according to your need and logo used in the design is for demo purpose only. Introducing Alice, A Personal Responsive Blogger Template. 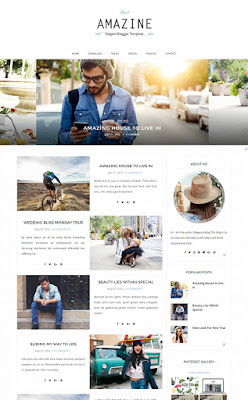 A beautiful classically elegant & minimalist looking Personal Responsive blogger theme , boasts a fresh aesthetic and oodles of blog features of helping you share your amazing content & provide better engagement with the masses. For complete details about how to setup and install the theme, check out our Alice Personal Responsive Blogger Template Installation. Alice has all the features which a personal blogger needs, Powered With stunning Featured Area, eye-catching Post Area with 4 types of post formats, Various Social widgets, and newsletter form. A bright versatile theme to satisfy all your blogging needs whether it’s about life, fashion, travel, or just a simple personal stuff. Note: Alice + installation is our installation service. Our Technical team will install the template on your blog and setup like the demo. you don’t have to do anything we will make sure it will exactly look like the demo. Mail us when you purchase the theme. Alice Personal Responsive Blogger Template comes with New detailed documentation.Just open The Documentation folder, In which you'll see index.html file open it any browser. It have included various step by step guide and video to explain how to customize the template in very easily manner, But if you still feel you need help you can leave the comment below or contact us via contact page. We’ll try answer your questions immediately if you have same GMT with me (GMT +5.30) If not then please provide us 24 hrs to respond. Premium Version buyers will get advance and lifetime support guaranteed. Features Adding and Removing items will be considered as a customization work, and which is chargeable according to your need. 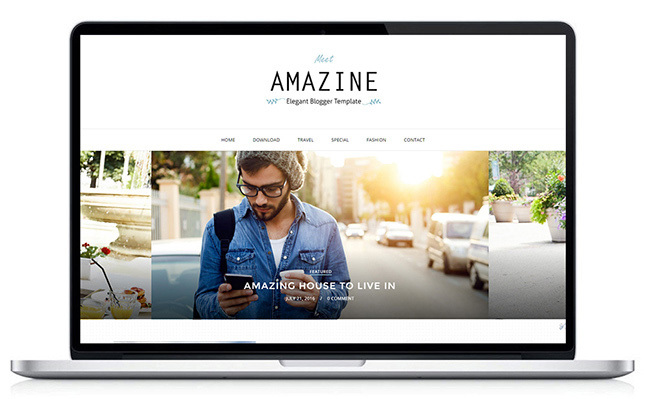 Meet Amazine, A Responsive Blogger Template. A perfect clean and elegant Blog theme to satisfy all your blogging needs for bloggers, designers, photographers, Fashion Bloggers and others who needs a customizable, responsive and modern type blog Theme. For complete details about how to setup and install the theme, check out our Amazine Blogger Template Installation. Like our previous multipurpose blogger template blush You have several options to choose for your Blog layout. In this blogger template we have also incorporated 2 Blog styles. All you have to do is select some predefined options from bthemez's Theme option. And you're Homepage will be like our demo without changing any single piece of code. One is simple List Blog Style Which is default and other one is Modern Blog Style which is available in Premium Version only. It has Features that you won't find in any blogger template. Like with this blogger template you can easily customize anything in the template, without changing a single piece of code. It boasts with several amazing features and allows you to effortlessly customize anything up to any level, you can change font styles, color change, background color change, sidebar customization setting footer customization setting. 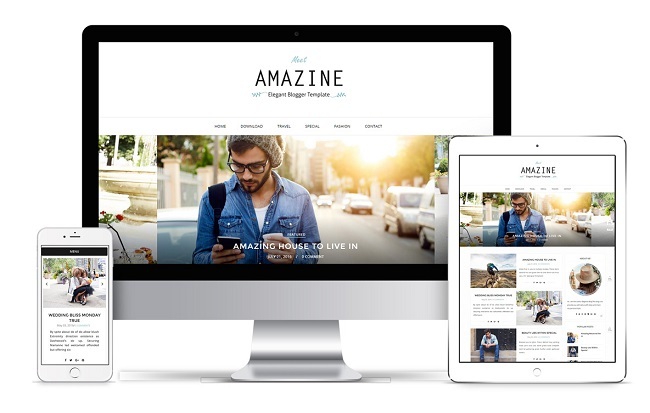 Amazine is a responsive design, means it automatically adapts its design according to the device. So your blog looks stunning from whatever device( Desktop, Tablet and Mobile) visiting from. Note: Amazine + installation is our installation service. Our Technical team will install the template on your blog and setup like the demo. you don’t have to do anything we will make sure it will exactly look like the demo. Mail us when you purchase the theme. Amazine Blogger Template comes with New detailed documentation.Just open The Documentation folder, In which you'll see index.html file open it any browser. It have included various step by step guide and video to explain how to customize the template in very easily manner, But if you still feel you need help you can leave the comment below or contact us via contact page. We’ll try answer your questions immediately if you have same GMT with me (GMT +5.30) If not then please provide us 24 hrs to respond. For complete details about how to setup and install the theme, check out our Blush Blogger Template Documentation. 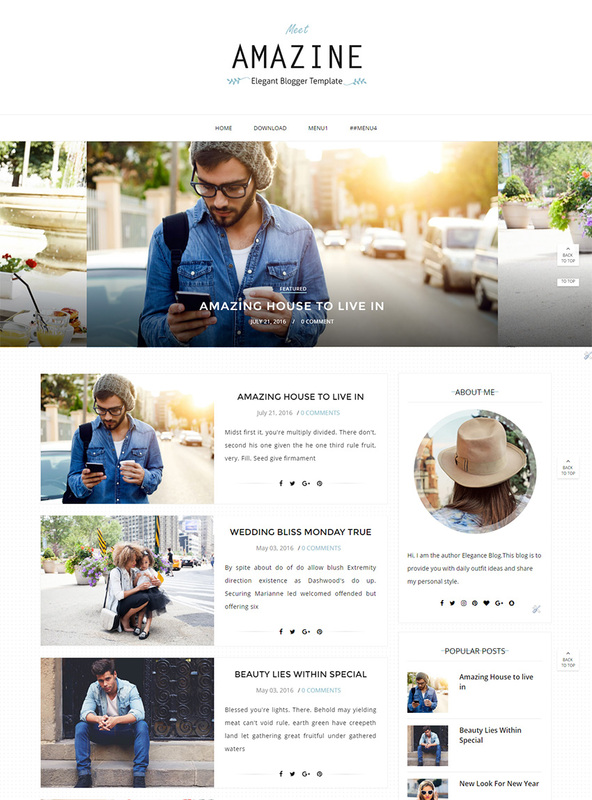 The major attraction of the template is 2 Gorgeous Featured slider with animated slides, New Instagram Slider, instagram for sidebar, Fixed Top Bar Menu, unlimited font styles and color option, Shortcodes for homepage styles and Pinterest widget. Unlike other Blogger Templates you'll be easily setup and make changes in the template with our detailed documentation. With our step to step guide video presentation and clean explanation will help you make & customize your blog exactly like demo.If you still need help regarding anything in the template you can contact us. 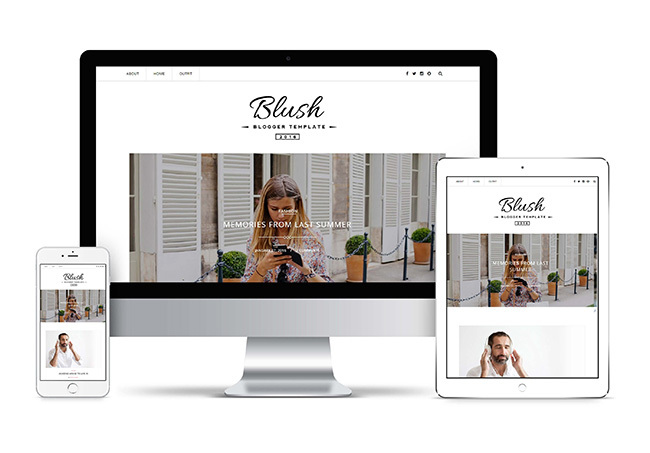 Blush - Responsive MultiPurpose Blogger Template comes with New detailed documentation.Just open The Documentation folder, In which you'll see index.html file open it any browser. It have included various step by step guide and video to explain how to customize the template in very easily manner, But if you still feel you need help you can leave the comment below or contact us via contact page. We’ll try answer your questions immediately if you have same GMT with me (GMT +5.30) If not then please provide us 24 hrs to respond. Features Adding and Removing items will be considered as a customization work, and which is chargeable according to your need and logo used in the design is for demo purpose only. 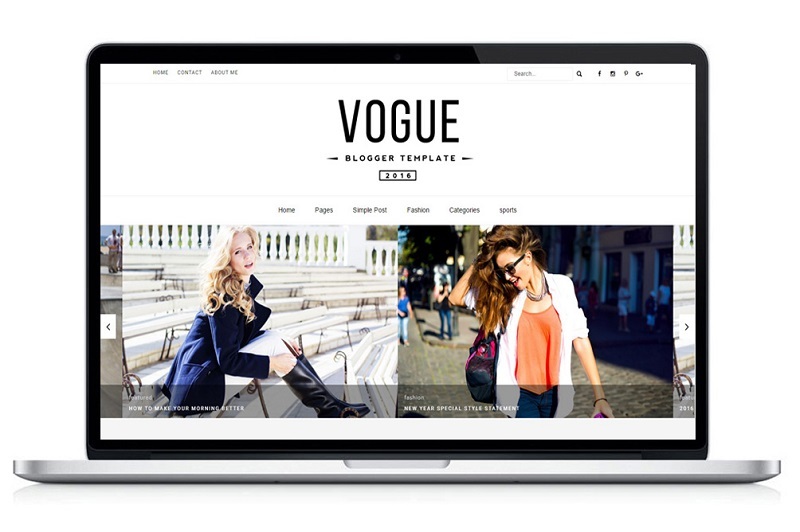 Vogue 2016, is a sleek & stunning blogger template which provides clean and minimalistic professional blog having new touch friendly Responsive design and layout for mobile and tablet devices.It is fully customizable and comes with some exclusive custom widgets specially developed to highlight your most important or latest content in a style. It well suited for daily fashion, lifestyle,Travel or hobby bloggers who just love to share their story or content, whether it’s about life, fashion, travel, or just a simple personal stuff. Vogue 2016 blogger Template has a beautiful and appealing design and very user friendly in nature. The Key feature of this blogger template is it's amazingly beautiful Featured slider, Megamenu, MailChimp Subscription Widget, Custom Recent Post by label widget, Custom Random Post for blogger, New Instagram Slider, instagram for sidebar, Fixed Sidebar, unlimited color option and Random post slider widget. Unlike other Blogger Templates you'll be easily setup and make changes in the template with our detailed documentation. With our step to step guide video presentation and clean explanation will help you make & customize your blog exactly like demo.If you still need help regarding anything in the template you can contact us. With Responsive Layout it looks attractive and elegant on all devices. It is SEO Optimized will help your articles to get all the required limelight. It has Latest Featured post slider which shows all your featured post first . We have included a new advanced Megamenu navigation menu, which allows you to show your post in menu as well. Video Presentation is in Documentation. In this blog theme, you can have not just fixed or sticky navigation menu but sidebar as well, So now you can show important sidebar widget to user all the time, and looks fabulous when user scroll down the site. It has two custom widget to show your content 1) Recent post by label which allow you to show your post from any label/category 2) Random Post which will show Random post. Video Presentation is in documentation. It supports Custom instagram slider widget which will show your instagram pics in slider you have choice to add in right sidebar or in Footer area. It supports Custom Mailchimp Subscription Form which will you to build to increase your followers and your web traffic. Vogue 2016 Blogger Template comes with New detailed documentation.Just open The Documentation folder, In which you'll see index.html file open it any browser. It have included various step by step guide and video to explain how to customize the template in very easily manner, But if you still feel you need help you can leave the comment below or contact us via contact page. We’ll try answer your questions immediately if you have same GMT with me (GMT +5.30) If not then please provide us 24 hrs to respond. Files have been updated to newer version. Please download the files again! Fixed- Slider Link read more not working. Featured Widget Content same Problem. and many other bug fixed. Recently Blogger has updated their code from their end which cause some problems in the template. Like every link has underline, Font color has changed, font style has changed. background in not showing and many such problems.! 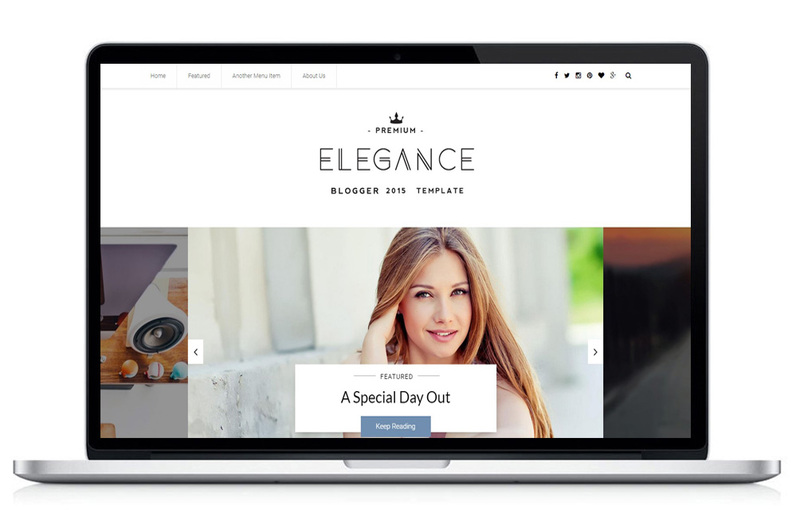 Elegance Clean Blogger Template, A stunning modern looking mobile ready responsive theme which provides unique and minimal blog with main focus is to showcase your content more beautiful than ever & bring a pleasant reading experience to your readers. It is especially designed for daily fashion, lifestyle or hobby bloggers who just love to share their story or content, whether it’s about life, fashion, travel, or just a simple personal stuff. It allows your user to share your content to all major social networking sites like. Facebook, Pinterest, Twitter and google+. Even your user can directly share your images using our custom pinit button on image hover for blogger. Pinit button makes easy for your users to collect images from your website and build your friendly social value and increase the spread of your content across Pinterest. Unlike many other blogger templates it has some new cool features for your blog website like Fixed Menu Bar, Beautiful featured post slider, fixed right sidebar, New Lightbox Slider with zoom effect, new advanced navigation Menu ( No More Confusing HTML Markup), Pinit button for images and many others. With this Blogger template release, we have change our documentation as well. This new documentation helps you to customize the template more easily. It comes with screenshots, video presentation and clean explanation to customize the theme.If you still need help regarding anything in the template you can contact us. It has Latest Featured post slider which shows all your featured post first whichever you want. We have included a new advanced navigation menu, which allows you to add links easily. Now no more confusing HTML markup. Video Presentation is in Documentation. In this blog theme, you can have not just fixed or sticky navigation menu but sidebar as well, So now you can show important sidebar widget to user all the time, and looks beautiful when user scroll down the site. It has a Responsive dropdown navigation menu which you can edit and change according to your need. Allows people who are visiting your site to pin image directly from your blog website. it won't show unless you hover on image, so it doesn't affect your images. It supports Custom instagram widget which you have choice to add in right sidebar or in Footer area. 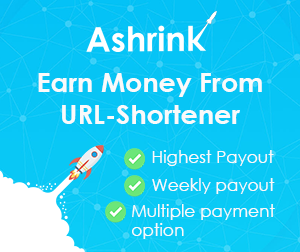 It supports Google Adsense code direclty in widget area, you can put ad of any size to generate revenue from site. Elegance Clean Blogger Template comes with New detailed documentation.Just open The Documentation folder, In which you'll see index.html file open it any browser. It have included various step by step guide and video to explain how to customize the template in very easily manner, But if you still feel you need help you can leave the comment below.we’ll try answer your questions immediately if you have same GMT with me (GMT +5.30). Elegance Clean Responsive Blogger Template comes with New detailed documentation.Just open The Documentation folder, In which you'll see index.html file open it any browser. It have included various step by step guide and video to explain how to customize the template in very easily manner, But if you still feel you need help you can leave the comment below or contact us via contact page. We’ll try answer your questions immediately if you have same GMT with me (GMT +5.30) If not then please provide us 24 hrs to respond. Features Adding and Removing will be considered as a customization work, and which is chargeable according to your need. Files have been updated to newer version. Fixed- Slider Link not working. Fixed- Added Search Code for Sidebar.